Marvin Bad News” Barnes was considered a future Hall of Fame basketball player before he even graduated from college. A standout at Providence College, where he averaged 20.7 points and 17.9 rebounds per game, he was an All-American with the world at his fingertips. Throughout his life, every time it appeared that Bad News” had turned the corner, his demons reappeared and succeeded in luring him back into becoming a conniving dope fiend. With stories and quotes from Julius Erving, Bill Walton, Larry Brown, Mike D’Antoni, and many others who crossed paths with Barnes, as well as a foreword from former Spirits announcer Bob Costas, Bad News” is the story of a squandered talent who could never defeat his inner demons. "Brutally honest, tragic, and fascinating, Carey’s grim cautionary tale exposes the highs and lows of the complex basketball superstar." ““Bad News” should be a must-read for every sports fan. It’s the story of a supremely gifted pro basketball player who gained fame and riches at a young age, only to lose all his self-respect and his entire fortune in a few short years due to a self-destructive nature and addictions to cocaine and heroin. "Mike Carey didn't simply research the story of the talented and troubled Marvin Barnes. Carey saw it firsthand for nearly forty years. The result is a compelling look at a mercurial life." "Carey captures it all. Barnes’ floppy hats, his leather bells, his parading around town with the most gorgeous women in his silver, glistening Rolls-Royce with a red mobile phone long before ANYONE had a mobile phone. He goes back to the beginning and takes you through a ride in that Rolls. It’s a ride that is exciting and astonishing but incredibly predictable and ultimately sad." 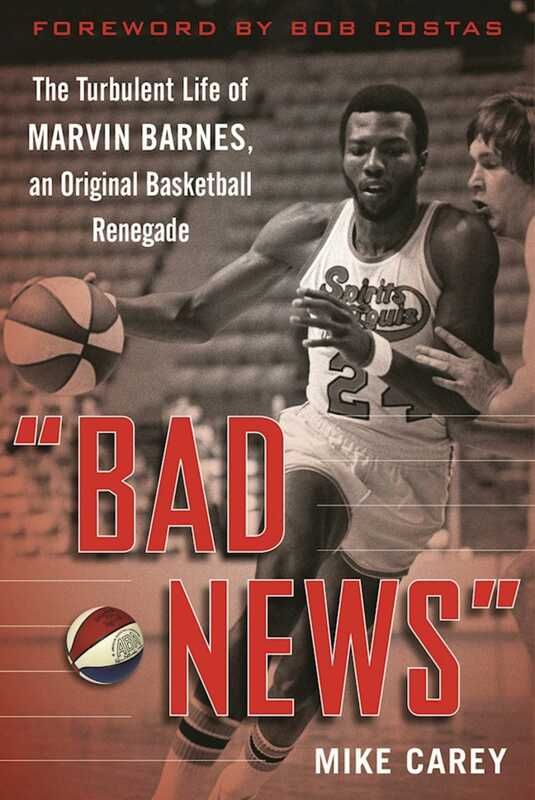 Bad News” should be a must-read for every sports fan. It’s the story of a supremely gifted pro basketball player who gained fame and riches at a young age, only to lose all his self-respect and his entire fortune in a few short years due to a self-destructive nature and addictions to cocaine and heroin. Book Cover Image (jpg): "Bad News"